Having hiked for consecutive five weekends now, we were on a roll. 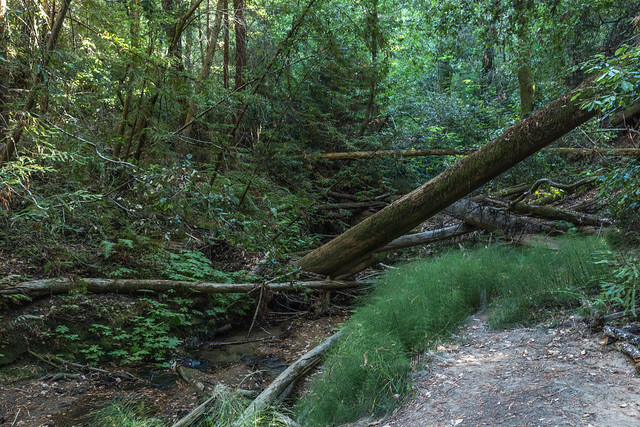 The sixth weekend happened to be a long holiday weekend and we had saved just the place to hike – the Big Basin Redwoods State Park. This state park had been on our list of hikes-to-do for quite some time. It is 40 miles southwest from our home in San Jose, a 1h 15min drive. The last 10-mile drive is on narrow, winding roads across the Santa Cruz mountains. We knew that the trail we had been planning to hike was long and there was no intermediate loop on that route to cut the hike short (I was proved wrong as you’ll find out later) should we feel the need to. We decided to hike on the Sunday of the Labour Day weekend so that we get a post-hike rest day, which we were sure we would need. 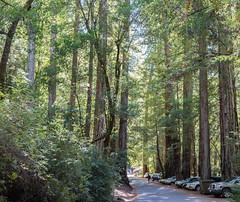 PARKING THE CAR: Perhaps many other folks had the same idea of spending the long weekend – that of walking in a redwood forest. And though it was extremely encouraging to later see on the trail so many enthused folks trudging along like us (or sprinting past), the parking space fell short for all the hordes of people (including us) who decided to show up that day. We were unprepared for this overflowing vehicular crowd and did not at all anticipate that getting a parking spot would be such a big deal. The ordeal began by first waiting in a mile-long queue of cars, each party anxious for its turn to get a parking spot. When it was finally our turn, we were told that the parking is full and it might be better to drive off to another neighboring state park!! As we inched forward toward the Park Headquarters, another park officer told us to wait in a holding area. Yes, there was a waiting area for cars should a spot free up in the actual parking lot! Luckily, upon getting a place in this holding area and after paying the parking fee (for a spot we had not secured yet), we did not have to wait for too long. We were asked to drive all the way inside the premises and look for a place. All the designated parking lots were indeed full. We drove up on N Escape Rd where people had parked on the roadside. We found a spot, learned our lesson, and felt relieved that we did not have to go back home without visiting the park. BEGINNING THE HIKE: After tucking our car in, it was time to begin the real action. Finally! At 3:10 P.M.! So. The plan was to follow the 1) Sunset Trail, take the 2) Berry Creek Falls Trail, visit the falls, and then take the 3) Skyline-to-the-Sea Trail back to the Park Headquarters. We chose this loop from a list of moderately difficult hikes suggested on the state park’s website. We took the Skyline-to-the-Sea Trail off the N Escape Rd to begin with, crossed the (dry) Opal Creek over a wooden bridge, and after a short stretch hit the Dool Trail on the left. This led us to the Sunset Trail, again on the left. We could already feel some incline. WALKING THE REDWOOD GROVE: The next half hour on the Sunset Trail added another 500ft of continuous elevation. We hardly seemed to mind the climb as we were engrossed in taking in the experience of walking in a forest. It was mesmerizing to walk through the redwood grove and fascinating to watch the tall, straight, and ancient sequoias. There was a mystical sense of peace and quiet inside the dense forest. The forest looked intense green and alive with the dampness and mosses. Forests that are close to the coast become moist from fog drippings even with the lack of rains. One of the trees, with a hollow, exposed trunk base, caught our attention; the trunk had apparently burned out. In fact, a lot of the redwoods along the trail had been charred by fire. A whole new forest world was unraveling in front of us and all we wanted to do was remain enchanted and keep taking pictures. We had to constantly remind ourselves to get back to walking. We were already running late, what with all the delay with the parking fiasco. GETTING WEARY: We had covered around 3 miles in 1h 15min. We were doing okay time wise, but we were starting to get tired. We could not take too many or too long breaks because we had to make good time while sunlight could still penetrate this thick forest. We also had not fed ourselves too well before starting this strenuous hike (another lesson for the day) and we were starting to feel low on energy. We did munch now and then on our protein bars. We had sufficient water with us but drinking too much ran the risk of needing a restroom. While we were huffing and puffing our way through the forest, I distinctly remember running into this family of husband, wife, a kid on husband’s back, and an elderly person. Like others, they asked us about the distance to the trailhead from where we were coming. They seemed to be tired and miserable but hopeful that they will make it back. In return, I asked them about the trail on the other side. They mentioned how the Berry Creek Falls were beautiful but the stairs and the steep incline made it all tough. We gulped and moved on. The tougher stretch was yet to come. TAKING THE WRONG TURN: I think by this time, we were done appreciating the forest and the wilderness beauty. We just wanted to somehow reach back without fainting. At around 5 miles, 2-hr mark, we realized we had been walking on the Timms Creek Trail when we were actually supposed to be on the Sunset Trail. In fact, the realization came only after we reached the junction where the Timms Creek Trail joins the Skyline-to-the-Sea Trail, and only because this junction had a marker for the Timms Creek Trail. We were so baffled – I was hearing of the Timms Creek Trail for the first time. Apparently, somewhere on the Sunset Trail, we took an unintentional left turn to the Timms Creek Trail (there was no marker here). The Sunset Trail was supposed to lead us to the Berry Creek Falls Trail, which we eventually decided to skip, considering our depleting energy reserves. (I later found out the Timms Creek Trail was considered a bail-out route for hikers who want to avoid the ascend to the falls!) The unintentional mistake turned out to be a blessing in disguise. GETTING BACK: Starting the hike on the Skyline-to-the-Sea Trail (away from the Berry Creek Falls) meant that we were on our way back. But because it was a different trail, the difficulty of this stretch was unknown. The last one hour turned out to have some of the highest elevation points of the hike. The ascent was steep in some parts and mellow in other parts. We happened to catch up with a group of young men and women and trailed them all the way to the parking lot. Listening to their chit-chat and keeping up with their pace kept us distracted enough from thinking of our miserable state. We felt ecstatic to have completed the hike. Once out of the woods, our next major concern was food. Luckily, the Big Basin Redwoods Store has an in-house cafe. Thankfully, it was still open at that hour on a Sunday of a holiday weekend. We grabbed some sandwiches and ate greedily. No matter the pain and exhaustion, we were happy we had hiked here and resolved to come again better prepared. Some interesting observations from the map about the Timms Creek Trail: it runs parallel to the West Waddell Creek. The West Waddell Creek meets the Kelly Creek around the same point where the Timms Creek Trail joins the Skyline-to-the-Sea Trail. Redwood is California’s state tree. 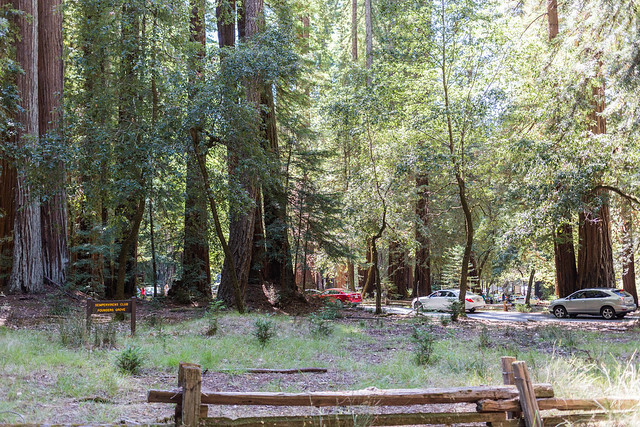 Located in the Santa Cruz county, Big Basin Redwoods is California’s oldest state park. It lead the way to launching the state park movement in California. The botanical name of these coastal redwoods is Sequoia sempervirens. Not only are they native to the United States, they grow only along the coast from southern Oregon to Central California. The state park offers group camping, trail camping, and horse camping options. One can even sign up for a guided hike. Parking Lot: Driving down on Hwy 236 from north to south, the parking lots are to the right and the Park Headquarters is on the left. Restrooms: Toilets are available at the trailhead. Map: You can buy one for $3 at the Park Headquarters. Exposure to sun: Mostly shaded. Crowd: Weekends are pretty crowded. There are multiple trail loops to choose from. The crowd could be moderate to heavy depending on the route you pick.